We picked Belize as the starting point for our adventure partly because we thought it would help us ease into the change in foods available to us to continue our plant-based diet throughout Central and South America. We also thought Belize was a good place to start as English is widely spoken, helping us greatly if we couldn’t communicate our requirements in Spanish. Luckily we were correct on both counts. We discovered to our delight that it was relatively easy to find our basic items like soy milk, oats, cereal, bread and peanut butter at any supermarket (less so of course at local small supply shops/kiosks). What was most surprising was the soy milk imported from Canada was cheaper than what it is sold for in Canada! Fruits and vegetables are also widely available, and if you stick to local produce, it’s very cost effective too. 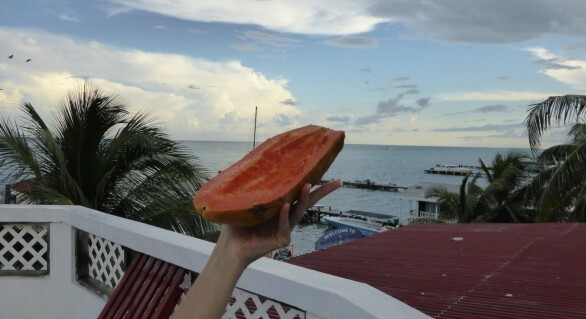 We paid $1 for 7 or 8 bananas, and about $1.50 for a very large papaya. As a comparison, we picked up 2 peaches (imported from the USA) at the market in Corozal for $5. We didn’t repeat that performance! Fruits and vegetables are best purchased at local markets, which are common in every town and village. Supermarkets tend to mark up quite a bit and the quality/freshness isn’t as good. 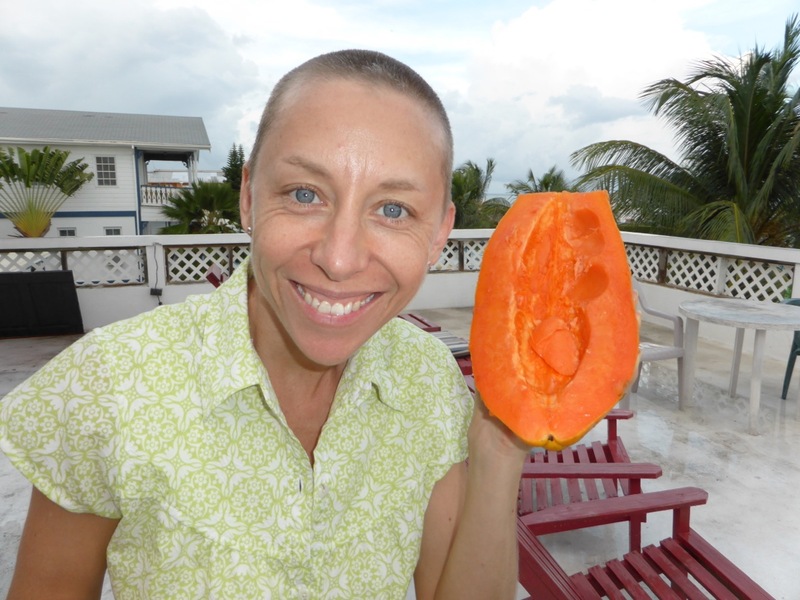 A papaya almost as big as my head for $1.50! Awesome! Organic fruit and veggies are virtually non-existent; we found one store on Ambergris Caye that stocked imported organic produce but it was extremely expensive (for example, $7 for a small bag of organic baby carrots). We decided to stick to local produce and save our budget from being wrecked after the first week! We didn’t have any greens or lettuces in Belize. These items carry a great risk for food borne illness as the soils and dirty water carry bacteria. Needless to say, from the outset we greatly missed our morning kale and banana smoothies! We decided to seek out a balance of hostels with and without kitchens so that we could cook our own meals but also eat at restaurants some of the time when a kitchen wasn’t available or when we wanted a break from making meals or wanted to explore the local flavours. Cooking meals on the road is cost effective and a very social experience in hostels – we met and cooked with a fun and diverse group of people in Corozal and on Caye Caulker. It’s also a fun experience to explore the aisles of local supermarkets to see what local foods are available – combined with wonderful fresh goodies from the market! 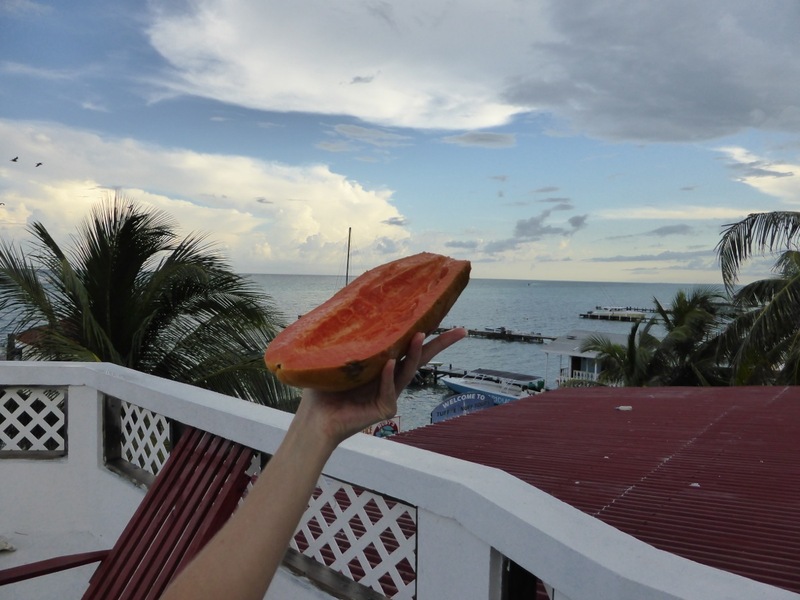 Our favourite spot was the bright pink fruit and veggie stall behind Yuma’s House Hostel (across from the basketball court) on Caye Caulker. 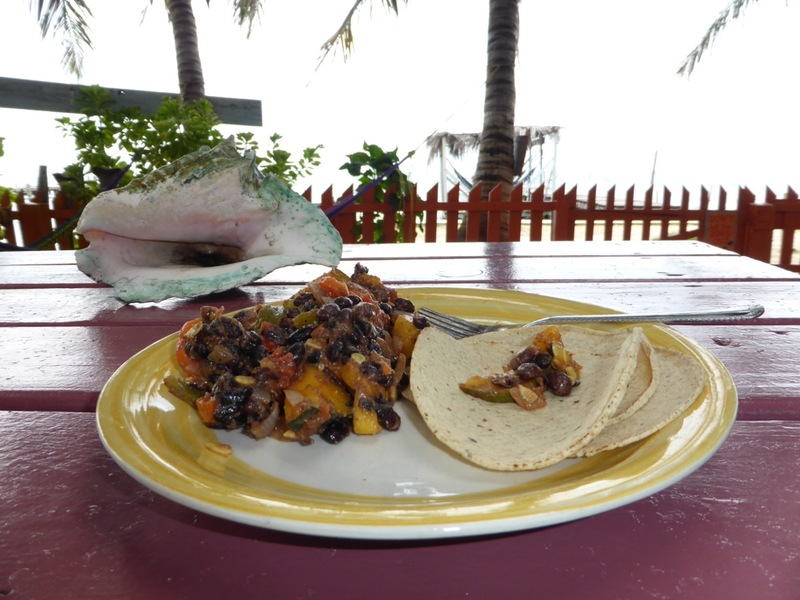 Home cooking at Yuma’s House Hostel: beans, veggies and tortillas – fresh and fantastic with an oceanfront view! 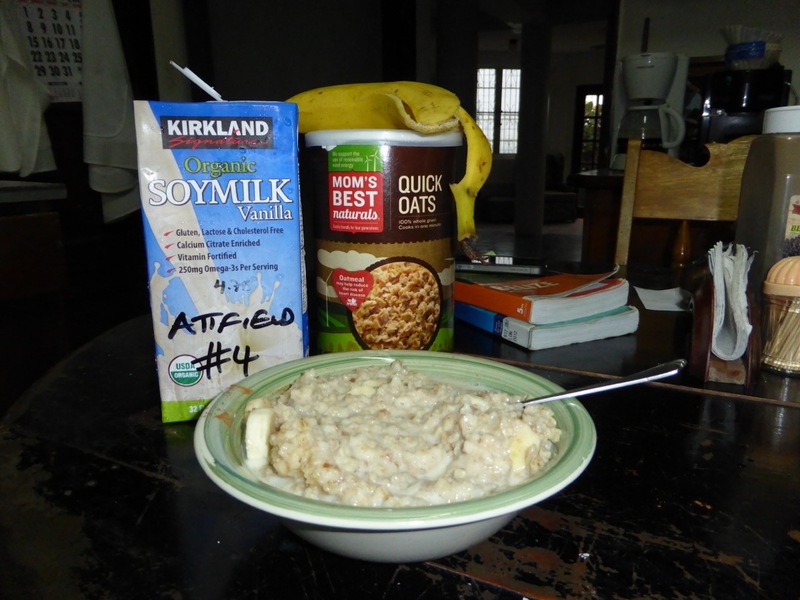 In Belize we typically made oats and tea for breakfasts, with fruit for snacks. Fruits were mostly bananas, oranges, papaya and watermelon. Lunches and dinners were typically pasta, curries, and beans and veggies on fresh tortillas – with a few peanut butter and banana sandwiches (or tortilla roll-ups) along the way. Eating out was relatively straightforward, even with our basic Spanish. Almost every dish that didn’t include meat or fish did include cheese, so we simply specified no cheese or dairy (sin queso o lactosa) and enjoyed several delicious meals along the way. Most of our meals out in Belize centred around the staple of rice and beans – made a little spicy with Marie Sharp’s hot sauce – a Belizean favourite! We also had other local fare like “pupusas” – flat corn cakes stuffed with beans (and other non vegan items of course, but we skipped those options!) and cooked on a griddle. 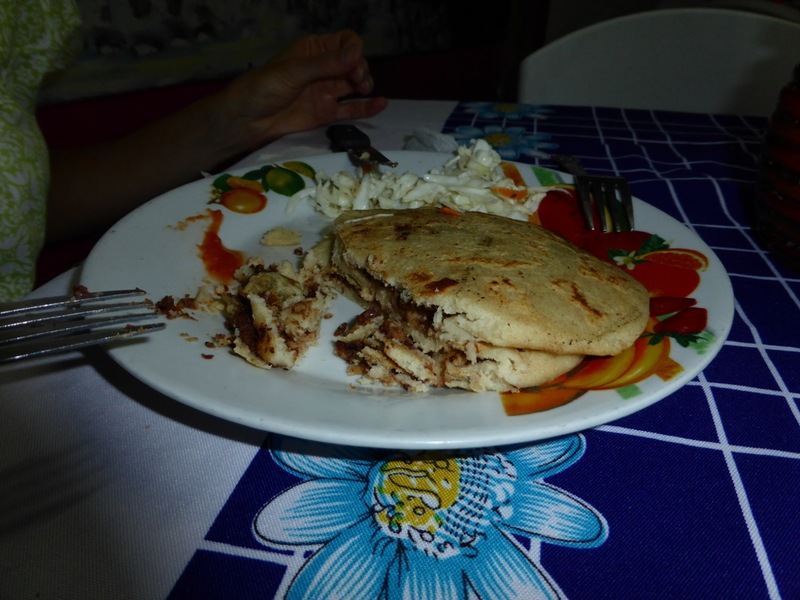 Pupusas are actually from El Salvador but Belize has adopted the dish and added their own flare to it. Another great dish we tried was “salbutes” – deep fried tortillas topped with fresh salsa, beans and guacamole. The more standard food we tried included pizza, burritos, falafels and hummus and veggie burgers. Non-local food and restaurants are more expensive than domestic options. As for beverages, we drank bottled purified water in Belize, along with coffee, tea, local beer (Belikin – regular and stout), and the water from one delicious fresh coconut! Beer is cheaper than water, and in the heat of the day, so much more refreshing! 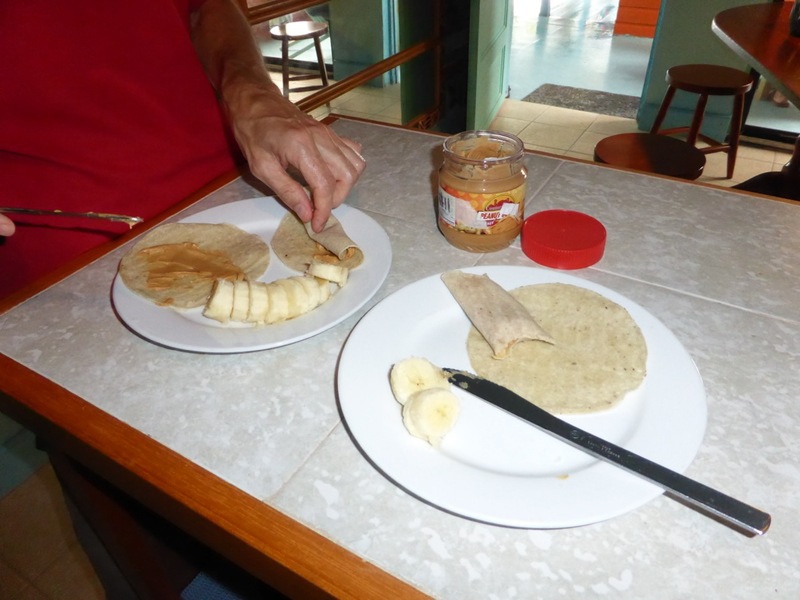 To summarize, it was incredibly easy and reasonably cheap to follow our vegan diet in Belize while ensuring that we had variety as well as nutritious meals. 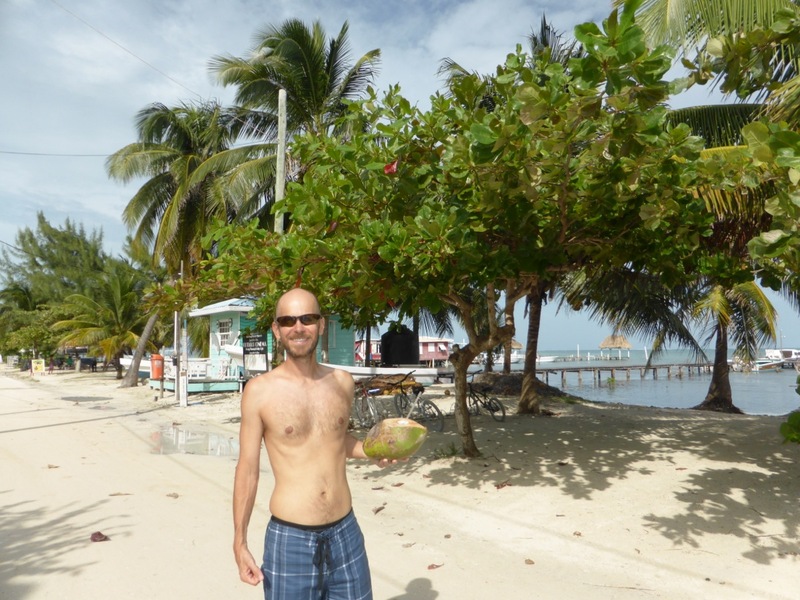 Aside from our first few meals in Crooked Tree where we struggled a bit to convey what our needs were and found the food to be very expensive relative to subsequent meals we had, we really enjoyed our time as vegans in Belize. Hey fruit lovers!!! Absolutely love seeing your pictures and those massive smiles. The locales, the sights and the culinary delights seem amazing. I love how the heat in the tropics makes the fruit taste even sweeter. Take care of yourselves and keep posting the updates - living the sun life vicariously through you guys as I look out and see the fresh blanket of snow coveringVancouver. Thanks guys! And may 2014 treat all of you really well too. You are awesome! Thanks for posting on your vegan trip to Belize. I am moving to San Ignacio, and although I've been before, I am always paranoid about being able to get a good vegan diet. Now I'm not worried, so thank you so much. LiVegan!